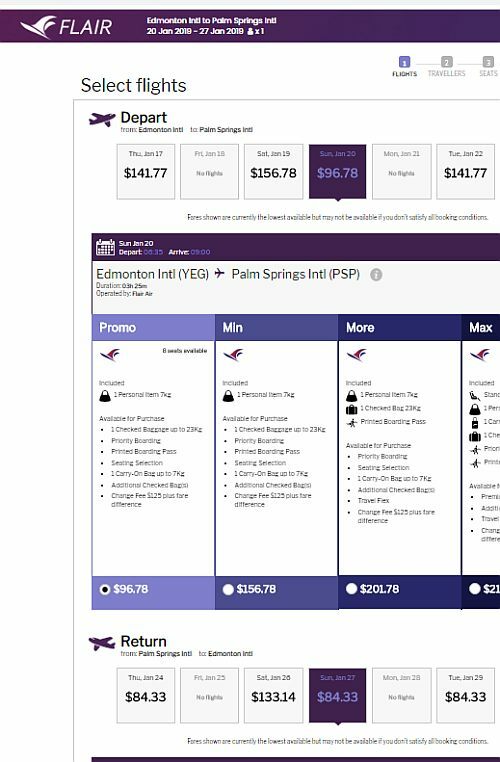 Flair Air has dropped the price of many of their flights from Edmonton to Palm Springs, California down to between $198 (personal item only) and $258 (with luggage) CAD roundtrip including taxes. $198 roundtrip is the base price, and only includes a personal item (must fit under the seat). $258 roundtrip is the price with carry-on or checked luggage included. - Look for the dates that are $99 on the way down, and $99 on the way home. - Look for the dates in December 2018 and January 2019 that are $96 on the way down, and $84 on the way home. - The promo code is valid for travel between December 16, 2018 and February 13, 2019 - but I've only seen the cheaper dates in December and January. edmonton, yeg, flight deals, united states, california, north america, palm springs, psp and flair air.